Tonkawa secretary, Roy Cook and Jerry Starnes got there early to set up the room for the noon TONKAWA meeting, March 12, 2006. TONKAWA President Esther Abrahano opened the meeting with a blessing and chaired the meeting. The TONKAWA Treasurer Vicky Gambala actively participated in clarifying many of the themes and events for the TONKAWA membership. Discussed at length are the remainder of the year and annual picnic expectations. Also, Vicky Gambala reported Henry Mendibles had approached her at the Women Wellness conference. He offered to provide grant-writing services for a 10% fee of what may be successfully funded. The Birthday girl, this St Patricks month, is Helen Halling, eighty six years young and a resident of National City for the past fifty years!. Don Vigneault enthusiastically led the birthday song! Traditional tribal teasing and good fellowship are some of the qualities that make this one of the most satisfying meetings of the month. Rose Davis, INDIAN VOICES publisher joked with the elders. She also brought copies of the latest issue for all to enjoy. 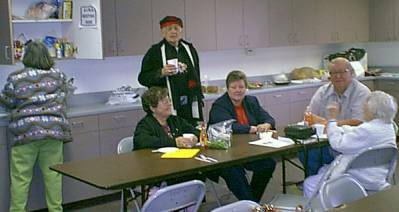 The membership was pleased to see Jean Vigneault and her Mother attending the TONKAWA meeting again. Jean had been in the hospital but she was doing better today. We had a good basic turnout that continued to grow as the afternoon continued. We all feel it was in large part to the efforts of our TONKAWA greeter Nellie Ruiz. She and Vicky Gambala called and reminded the members of this meeting. Thank you both! After the weekend showers this is a delightful breezy afternoon to enjoy the splendid potluck. Resident chef Jerry Starnes took care of the main dish: Keeping with the St Patricks theme we had corned beef and cabbage with boiled carrots and finger potatoes. Side dishes included excellent Henrys bread with butter, potato salad, fruit salad, rice casserole and (throw away the diet) two yummy pies. Coconut cream and apple. Don declared them both sugar free so we did our best to do them justice. After much ingenuity in opening a new can of coffee we enjoyed quarts of good hot coffee all afternoon. Maybe we will see you and a friend (We are always recruiting interested Elders to be TONKWA members!) 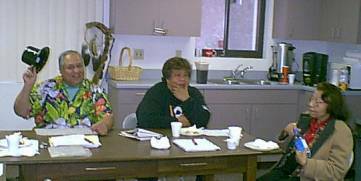 at our next TONKAWA meeting, noon April 9, 2006, at the Many Nations: Chet Hunt Community room, 3928 Illinois St. San Diego, CA. 92104.